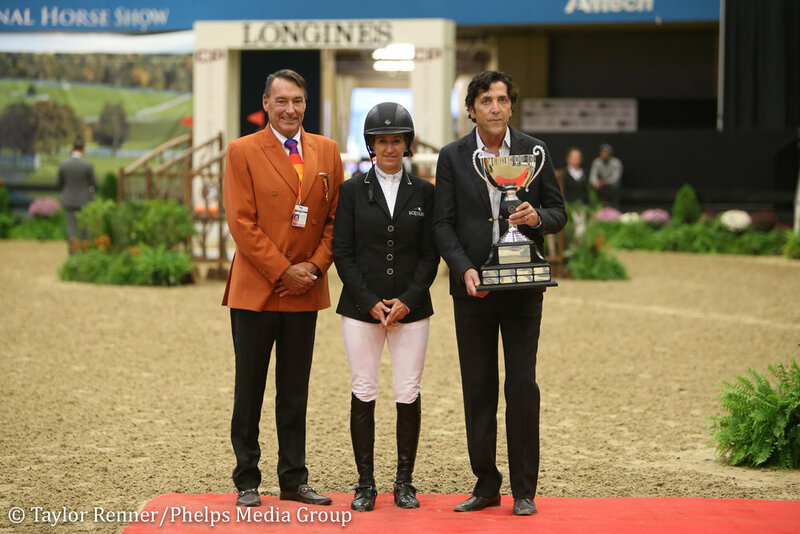 Wellington, Fla. - Nov. 8, 2017 - M. Michael Meller of Gallagher/Meller Sport Horses was proud to award the inaugural "Doc Spirit" Award during the Washington International Horse Show in Washington, D.C. to Cristalline, owned by Starlight Farms, LLC and shown by young amateur rider, Adrienne Sternlicht. The "Doc Spirit" Award will be presented annually in honor of the late Dr. John R. Steele to the horse that best exemplifies the heart and athleticism necessary to be competitive at the highest levels of show jumping. Dr. Steele's longtime friend Missy Clark and colleague Dr. Tim Ober accompanied Meller during the presentation. Dr. Steele, lovingly referred to by many as "Doc," passed away earlier this year at the age of 91. He was a pioneer in top-level sport horse medicine and boasted a renowned career as an acclaimed equine veterinarian. The purpose of this award is to recognize his tireless dedication and countless contributions to the sport and his love for horses. Sternlicht, of Greenwich, Connecticut, was honored to find out that her mare would be the first horse to receive such a prestigious award. "I found out earlier today from Michael Meller, who is a great friend of mine. He has always been a huge fan of the horse and in complete awe of her as I have been," Sternlicht said of the 2008 Bavarian Warmblood by Cristallo I. "I didn't know Dr. Steele personally, but I work very closely with Dr. Ober [U.S. Show Jumping Team Veterinarian and Dr. Steele's business partner]. I have heard the most incredible things about him as a vet, horseman and as a person in general." "My horse, as I've spoken about her before, I cannot say enough good things about her," Sternlicht acknowledged. "I've always said she's a bit of a savant. She is a true embodiment of the sport- she's brilliant, very talented, athletic, and very well-built." She continued, "Even Dr. Ober is always amazed by the condition of the horse, so I think she's the perfect horse to be the first recipient. I'm very grateful to have her in my life and be able to share her with my country and the people on my team." "Peter Lutz and I always admired Cristalline, who truly showcases all of the qualities of an international horse," concluded Meller. "Through an award like this we also have to acknowledge all of the people who have maintained the bloodlines and continued to breed these incredible animals for the sport that we love." Most recently, Meller took center stage once again to present the M. Michael Meller Style Award on Saturday, November 4, at the 2017 CP National Horse Show, prior to the evening's highlight event, the $250,000 Longines FEI World Cup™ Jumping Lexington CSI4*-W. Donated in memory of Pat Van Dyke Fischer, the Style Award was presented to Laura Kraut, of Wellington, Florida. The M. Michael Meller Style Award is presented each year to the international equestrian who exemplifies the best style of riding along with maintaining a sportsmanlike composure. Some of the most recent winners of this honor include Heather Caristo-Williams, Callan Solem, Mavis Spencer, and France's Eric Navet. "Michael and I were just saying how he and I have been friends for decades. I'm very honored to receive this award," Kraut, who is presently the leading female rider in the Longines World Rankings, said. "I think that it was very kind of him. I've had a good week this week. It's always an honor to win the Style Award. I don't do it often, so this is a surprise. It's always an honor, particularly here at the National Horse Show." Kraut also earned the Leading Lady Rider Award after her consistent top placings throughout the week at the CP National Horse Show, which included winning the $35,000 International Open Jumpers Welcome Speed CSI4*, and a second place ribbon in the $130,000 CP Grand Prix International Open Jumpers CSI4*-W.
To learn more about the "Doc Spirit" Award, the M. Michael Meller Style Award and Gallagher/Meller Sport Horses, please visit GallagherMeller.com.